Alamos Photos, History and More…. If you are one of those who can’t get quite enough of Alamos, we have a link here that can take you to hundreds of professional photos, history, events and its culture. The initial page will give you some idea of what you missed recently with the annual film festival. On that page there are many highlighted links to other areas of photos and information about the village. We thanks Anders Tomlinson for his decades of work photographing this wonderful village and its people. He is a true pro and we hope you enjoy his work. We hope you have a wonderful summer. Don’t forget that our Hacienda de los Santos rates drop to the Summer rates on May 1st. For five months you can enjoy the best of the village, and Hacienda de los Santos, for about $100.00 (USD) less per day. Visit the ‘Events’ section for dates on the August and October ‘Club Piloto Reunions’. The Alamos Film Festival (Festival Internacional Cine Alamos Mexico) is just a week away. Many original films will be shown during the three day festival, plus a debut of one which was filmed in Alamos, ‘Yerba Mala’. This year the festival is in honor of Mexico’s most famous leading lady, Maria Felix, who was born in Alamos. The light bulbs in the cantina were reproduced with the original Edison equipment, some of the porcelain fittings and shades are original Edison too. It was on December 31sr, 1879 that Edison finally was able to design the ideal light bulb of its time. The authentic Edison reproduction bulb which we have in Zapata’s Cantina is no longer available. The ones on the market today are similar in appearance, however mass produced, and have a modern and short life filament. Our Cantina light bulbs were each hand blown and assembled by hand by a man who purchased some of Edison’s bulb making equipment long before commercial companies began a knock-off of the bulb. Jim and Nancy found the bulbs and fittings in a Minnesota antique shop in the 90’s. Only one bulb has failed in the past 12 years of continual use and some say they never go bad. One was found at the base of the Quintera silver mine at Aduana in the 1950’s by Don McClain, the Canadian mine manager who reopened the mine briefly. The 1,200′ shaft had to be pumped free of water first, then then descended to the bottom level. A single Edison bulb was still attached to the original cord and was not broken. Don took it to his home in Alamos and proudly showed Jim, in 1990, that it still worked after being under water from about 1915 to 1952. 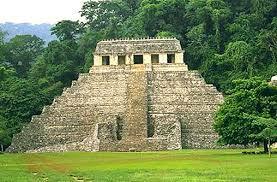 The Mayans did know how to build! Maybe they invented the manferd roof too. Photo from a nearby pyramid with a King’s tomb. As we get nearer to Christmas many of you are making plans for the Baja and Mainland Mexico. 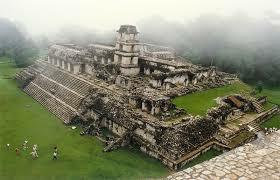 For the ‘Mainlandites’ here are some great recommendations for seeing some of the best of pre-columbian Mexico. A comprehensive article written by Duncan Hunter recently appeared in a publication. I contacted Duncan to see if we could do a re-print on the ‘Club Piloto Blog’, however he was hired to do that specific story and they would not allow him to send it to other media. He suggested that I just do a link to the article. Below you will find the link. If you have questions about current history given areas just let me know and I’ll try to put you in touch with a pilot who was there in the past few months. One neat thing about the sites, they don’t change, however the airports and access does and usually we see improvements. Christmas preparation at the Hacienda this year is nearly finished thanks to Rito and his many helpers. Besides making sure we have the turkeys and Christmas decorations proper clothing for our Posada for the Wise Men, Mary and Joseph and a Christmas tree in the Portal, this year we have 15 extra Santa’s helpers. This group of construction workers have been with us since July when we began a new building project which will be a great gift for future guests at Hacienda de los Santos. Before telling you about what’s happening at the ‘Sugar Mill’, here’s a portion of the history on this unique property which we hope you history buffs will find of interest. The present day fountain was built in the 1600’s as a mill for sugar cane. A long wooden beam was attached to a center pivot point of the mill, with a stone grist wheel mounted to the beam. A pair of oxen, or mules, would walk around the outside of the mill structure and stalks of sugar cane would be tossed into the mill to be crushed. With a slightly sloping floor the liquid which drained to one side of the stone/concrete floor where it was collected. The liquid was taken a short distance to the processing building and a portion of this process involved above ground tanks built of stone and concrete. Two of these were in what today is the Cafe Agave, along with one portion of the original wall from the 1600’s which is still visible today as you dine inside. Unfortunately the mill operation was created before the Spaniards fully understood the areas unique climate. Many years the cane production failed in the fields and the venture proved to be unprofitable. Ironically, they nearly had it correct because only 75 miles south one enters an ideal region which runs for more than a hundred miles. Beautiful sugar cane fields today can be seen along Mexico’s Highway 15 toll road north of Los Mochis. How did the sugar mill survive more than 300 years? Fortunately for the Swickards, and Hacienda de los Santos, the mill (today’s large fountain) was still very much intact in 1999 when they purchased the former sugar mill from the Caesar Murrillo family. The Murrillos were the only owner’s of record since the first Spaniards settled the Alamos area in the 1600’s. By the way, did you know that the village was incorporated in 1682 and the church records date to the 1600’s? After several years of poor cane production the mill was closed in 1710. The Murillo family decided to make the primary mill storerooms into a home. Three of the ‘bedrooms’ were windowless since that provided more ideal conditions for the storage of the processed sugar and the Swickards only added the windows during the renovation in 2001. The family converted what is today’s ‘Zapata’s Cantina’ into a living room area and a ‘cocina’ was adjacent. A free standing ‘facility’, with plumbing, was between the ‘house’ and the fountain. Although the processing building had disappeared through the centurys, the excellent foundations still were quite visible. Using most of the footprint of the 1600’s structure, the Swickards designed and built (with the help of the ‘Master Colonial Architect Felipe Almada of Navojoa) what today is the Cafe Agave and what will be in 2014 the new ‘Deseos’ gift shop. Plus there are behind the scenes areas in the building for an employee lounge and storerooms. The photo above was taken looking from the former sugar cane processing area toward the mill which today is a fountain. The structure itself is only slightly visible due to bouganvilla. In the background you will see a building which appears to be in ruin. Actually it is brand new and should be finished by March 1st. More on that in the next blog. Until then, we home you have the most wonderful Christmas and New Year’s. The Mexican commercial aviation industry encompasses approximately 30,000 employees and serves as many as 28 million passengers annually. The Airlines market in Mexico has been taken over by the emergence of the “Low Cost Airlines” entering the Mexican market eight years ago. And even more recently we find the “Regional Airlines” along with the traditional Aeromexico. The trend for this year, according to the National Chamber of Aerotransportes (Canaero), is positive. They argue that total passenger traffic for airlines operating in Mexico has a potential for expansion from 10-12% in 2013. This projection is supported by the aggressive expansion of the fleet aircraft and another “if” the Economy in Mexico manages to grow around 4%. The Mexican airline industry has had black numbers ever since the second quarter of 2012. This was due to the sharp increase in passenger traffic and in turn reflects stability in the cost jet fuel. Although the financial health of the global Airlines is slowly improving, the International Air Transport Association (IATA) increased its expectations for growth in earnings this year. It is anticipated that airlines earn about US$12.7 billion, compared with US$10.6 billion estimated in March. In its report Financial Expectations for this year, the IATA said the reason for improvements in the forecast is that structural changes have been improving the ability of the industry to generate income despite economic conditions. The aircraft manufacturer Boeing announced the plans to sell between 377 and 435 planes in Mexico over the next 20 years. According to Van Rex Gallard, Vice President for Sales in Latin America, this represent between 13% and 15% of the expected total demand in Latin America, Africa and the Caribbean. The National Chamber of Airlift in Mexico (CANAERO), meanwhile, reported that in March 2013 the domestic market grew 5.9%, while the international market did a healthy 10.9%. Andres Conesa, General Director of Aeromexico, was elected unanimously in February as the new Chairman of the Board of the National Chamber of Aerotransportes (Canaero) and will lead the group until January 29, 2014. To promote air connectivity in Mexico as well as tourism, the Secretariat of Communications and Transportation via their General Direction of Civil Aviation (DGCA) will drive new regional airlines operating as TAR (Queretaro) and Aerojal (Jalisco). They are nearing completion of the processes required to start flying regularly with established routes and schedules. This was announced by Alexandro Argudín the head of the DGCA. Also interviewed in recent weeks are representatives of Aerocalafia (BCS) and Danaus (Queretaro). They have charter flights (domestic and international), but work on a demand for service basis, so there isn’t any visible record of their operations. For the Ministry of Communications and Transport (SCT), Aeromexico needs to fix their finances. This is a warning of imminent risk following the path taken by Mexicana Airlines, an airline that has been in bankruptcy for nearly three years. Aeromexico and their union faced a strike, but have now accepted a 4.7% increase in salary and 1.5% in rewards. “Aeromexico requires necessarily to improve their economic situation. If no improvement is shown, the labor trajectory is on a very difficult path…the same as it was with Mexicana.” This is what Gerardo Ruiz Esparza, Minister of the SCT is reported to have said. Although a bankruptcy agreement to rescue Mexicana has already been filed, a serious investor has not yet arrived with the ability to rescue the airline that has been in bankruptcy for over 30 months. This is what Ricardo’s Valle, General Secretary of the Association of Flight Attendants (ASSA), reported. After the meeting held by union leaders with the Minister of Communications and Transport (SCT), Gerardo Ruiz Esparza, it was again confirmed that they are still without a serious investor who can take care of financial liabilities, taxes and labor. Currently, Aeromexico is the most important Airline in Mexico, controlling the market share of Mexico, domestic and international. This year, the Company ratified Eduardo Tricio Haro as Chairman of the Board of Directors of the company and Valentin Diez Morodo as Vice President. Aeromexico operates flights with a fleet of 117 aircraft and has already ordered another 75. In their inventory are Boeing-737s for short and medium routes, plus the Boeing 767 and Boeing 777 for long flights. It has pending orders for a number of the new Boeing 787-8. Aeromexico Subsidiaries operate a fleet of Embraer EMB-145, Embraer ERJ-190 and McDonnell Douglas MD-83. Among Aeromexico, Aeromexico and Aeromexico Connect Travel, a total of more than 550 daily flights to 70 destinations on 4 continents are in operation. The first of 19 Boeing 787 Dreamliner aircrafts for Aeromexico landed in August at Mexico City’s International Airport (AICM). This is the route with which the airline will cover long-haul routes. The inaugural flight will be, for instance, from Mexico to Tokyo. Similarly, the second and third B787 aircrafts will arrive in September and start operations in October between the capital’s airport and Paris, France. There will be daily flights, in addition to some weekly flights to New York. At the end of the year, with this in mind, Aeromexico will have three Boeing 787 Dreamliner’s in its fleet. This adds up to a total of 19 aircraft that they will receive over the next few years. Aeromexico Connect is a subsidiary of Aeromexico with flights to 42 destinations, seven in the U.S. and one in Central America. They feature 350 daily flights making them the airline with the most operations in the domestic market. In total they are transporting 4.2 million passengers a year with 7 Embraer EMB- 190 jets and 37 Embraer ERJ145 jets. In the upcoming 10 years Interjet plans on investments to expand and renew its fleet that will exceed US$4.2 billion. The service is ideally placed to serve the domestic and international markets, “although their major focus will remain regional,” said Jose Luis Garza, the firm’s Director. The recently tested Interjet’s Sukhoi Superjet 100 is representing the Russian airframer’s commercial interests in North America, while the manufacturer works to smooth its production process and broaden its tentative presence in the region. Interjet represents the first customer that the airframer classifies as Western. In April Interjet received the first of 20 Sukhoi Superjet aircrafts and they must be delivered before the end of next year. Mr. Garza recalled that there is a promise of purchase for 10 more. This investment will be to the tune of US$800 million. Besides the new aircrafts, the airline’s Director reiterated that Interjet plans to renew its current fleet of 37 Airbus (plus four that will come in the following months). This will be done between 2018 and 2022, and includes the manufacturer’s latest model the 320neo. Thus, the airline remains committed to the Mexican market where it expects to add as many as 80 pairs of cities in the next three years. By the end of 2013 at least 10 new sites are expected. The Sukhoi Superjet (93 seats) is being required to firm up its boost in regional strategy numbers, although the initial delay was caused by technical issues. According to Flight Daily News, the airline is looking at setting up second-tier bases- potentially at Monterrey, Tijuana and Guadalajara – from which to conduct services that would otherwise not be profitable owing to their lower traffic demand. Interjet chief financial officer Alejandro Beristain Mercado says there are some 80 routes in which the airline could deploy the 93-seat Superjet – some of which emerged as a result of the collapse of Mexicana. Viva Aerobus started to operate in November of 2006. This Airline was created with the combined experience of Group IAMSA and Irelandia. IAMSA Group is the largest company in Mexico in terms of transportation services by bus. They have an important Presence in 24 Mexican states. Irelandia is the investment tool of the Ryan Family Which owns Ryanair, the largest European low cost airline. The company’s CEO, Juan Carlos Zuazua, said there are currently 18 Boeing 737-300 aircraft in operation, but toward the close of the year there will be 22, he pointed out. Viva Aerobus expects to serve 4.9 million passengers in 2013. This number represents an increase of 30% when compared to 2012, when it had projected an increase of 21% meaning 3.8 million passengers. The airline expects to open 10 to 12 new routes this year and add four new aircraft to its fleet. This was announced by Juan Carlos Zuazua, the airline’s General Manager. The Volaris CEO Enrique Beltranena emphasized that seven years after starting its operations, the Mexican Airline Volaris has transported over 27 million passengers and forecasts a figure of 9.6 million users in 2013. Volaris is the country’s lowest cost airline “We have the youngest fleet in Mexico, with an average age of four years. This consists of Airbus aircrafts A319 and A320″, explained Enrique Beltranena. “Our 43 aircraft,” he added, “are equipped with the latest technology, leather seats and more space between seats for everybody’s convenience. Not only that, but they are operated by an experienced team that is constantly trained to ensure the utmost safety and comfort throughout the entire trip.” Volaris announced in June that the Company signed a letter of intent for the purchase of 95 engines from the Firms Pratt & Whitney “P&W”. They are a division of United Technologies Corporation “UTC”, and its subsidiary International Aero Engines AG (“ASI”). The contract includes the purchase of engines and their maintenance for a period of 12 years. Volaris expects to close 2013 with incomes higher than US$1 billion. This means an increase somewhere close to 18% compared to 2012, Enrique Beltranena, the airline’s CEO, reported. Mexico’s regional carrier Aeromar recently took delivery of the first of two ATR 72-600s that it is leasing from Air Lease Corporation, thus becoming the first 72- 600 operator in Mexico. Aeromar has 18 aircrafts and in order to have wider distribution in the market and offer better service, is implementing a “host” system, taking into account that 67% of travel agencies in Mexico use this Distribution System (GDS). Aeromar’s fleet consists of the following aircraft which also includes the 10 ART 42-500; the 4 ATR 42-320; 2 CRJ200; and there are two orders for the ATR 72. According to ATR, the 72-600s offer superior passenger capacity compared to the smaller aircraft models, and lower fuel consumption per seat. On February 1, 2011, Aeromar and Continental Airlines implemented an agreement on all routes of the Aeromar Hub at Mexico City’s International Airport. Aeromar has started flying to more domestic destinations such as Durango, Matamoros, Ixtapa and Piedras Negras. On June 6, 2013, Aeromar and Iberia announced a codeshare agreement whereby passengers on routes operated by Aeromar can connect at the International Airport in Mexico City with Iberia and also with connecting flights to destinations in Madrid, Spain, parts of Europe, Africa and even the Middle East. Founded in 1994 as a shuttle service to tourist sites, Magnicharters has developed into a major Mexican commercial airline. Until now it has been considered as a low cost option and currently operates flights to 13 destinations. But the company is expected to grow further in both destinations and fleet. The company is engaged primarily in national tourism and beach destinations in Mexico. Presently, the company has nine Boeing 737 aircraft so it can offer its passengers a safe and comfortable trip. Magnicharters is renowned everywhere for its excellent personalized service and performance. Exhibit 1 shows that during the first semester of 2013, Interjet and Volaris led the market share of the National Airlines in the Mexican Market in regard to passengers with 3.5 million and 3.1 million passengers out of a total of 2.3 million. This represents 25% and 23%, respectively. But if we take the Aeromexico Group as one (Aeromexico with Aeromexico Connect) together, they enjoyed 35% of the market. As of September 19th….there are Four Rooms in the Posada Tacubaya and one guest room available in Hacienda de los Santos. Packages are only $1,249 & $1,399 respectively (plus tax). flying Central America, Mexico and the wilds of Alaska. live entertainment nightly including the Jimmy Buffet of Mexico, Mark Mulligan. ALSO……TWO GREAT AVIATORS AS OUR FEATURED SPEAKERS! Along with the various special events at this reunion we are very fortunate to have an expert as our speaker on ‘Flying Latin America’ with Jack McCormick. He’s nearly a household name when it comes to aviation and flying south (and north) of the border. Many of you know Jack from flights you have made with the BBP in the past. As President of the Baja Bush Pilots International Jack has lead over 1,200 aircraft on group trips throughout Mexico and Central America over the past 12 years, McCormick is recognized as an aviation expert for private aircraft traveling “South of the Border”. Originally Jim Swickard was going to speak on Spanish Colonial construction, however we were very fortunate to have an Alaskan professional bush pilot volunteer to be our second speaker at this reunion. Plus, our speaker loves Alamos and this region of Mexico. Aine Roberts, a very talented young aviator, began coming about ten years ago to Hacienda de los Santos with guests, as the pilot of a Westwind Grand Caravan. Six years ago she decided to try the north country and has become a very seasoned pilot there in various types of aircraft, including turboprops. When the winters become too severe she sometimes does charter work in Hawaii as a pilot who takes tourists around the active volcano on the big island. a young lady flying in one of the most challenging areas of America. October is a beautiful month for flying in Sonora, Mexico. 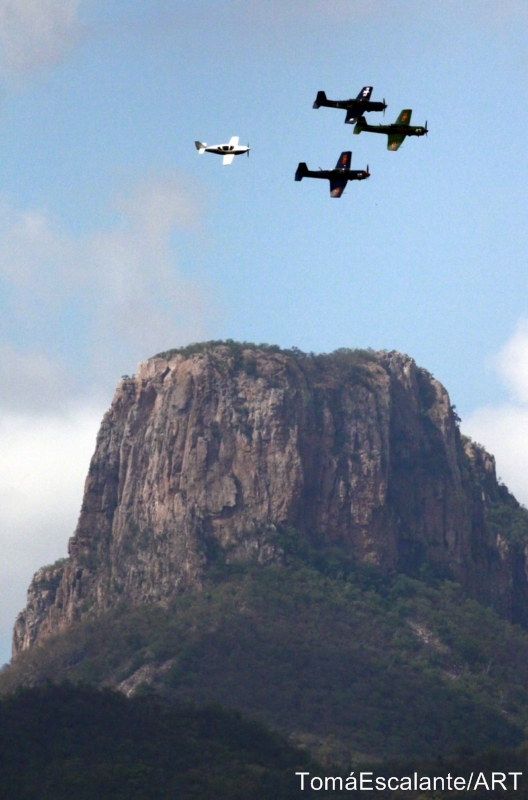 If this is your first visit be sure to visit www.clubpilotos.com for ‘flight planning’ details. As a rule ‘there are no rooms at the Inn’ after October the first, so send Jim an email today to reserve your room or suite at jnswick@aol.com. Also, remember you will receive a $100.00 credit if you bring another couple or send them to us for this event. Also, for more information on this special event visit: www.clubpilotos.com. While on the site check our calendar for events this coming year, plus the special section on ‘Club Piloto Packages’ and the ‘Blog’ for informative aviation updates as well as other ‘Hacienda’ and club information. If you are into long range planning for your Oshkosh trips, here’s a reprint from the Wichita Eagle. Below are the dates through 2020. (Check the ‘Calendar’ on this site for ‘Club Pilotos’ October and February ‘Reunions’. Each year, scores of Wichitans are among of the 500,000 people who travel to Oshkosh, Wisc., for the annual AirVenture fly-in convention, sponsored by the Experimental Aircraft Association. “We realize that the dates of EAA AirVenture affect yearly schedules for the entire aviation community as well as events throughout the Wisconin and the Midwest, so we want to secure these future dates to minimize conflicts,” Rick Larsen, EAA’s vice president of marketing, said in a statement. Posted Aug. 29, 2013, at 11:00 a.m. If someone would have asked me a year ago, “How old are your ears”, I probably would have replied well they are 72 years old, but doing pretty well considering all factors. As a pilot I have found that I not only have enjoyed thousands of hours with my headsets (Bose especially), but they also always helped me overcome any hearing deficiencies just by adjusting the volume control. I can’t do that in everyday situations, or especially in noisy environments where my hearing really goes bad. Going back to the young age of 23 I spent many days at Lackland AFB and Camp Bullis (Army ranges) firing various weapons. I don’t think that any form of ear protection even existed back then. When returning from San Antonio to the Colorado Air Guard unit we were required to do a certain amount of firing line time due to my being in the air police group. One day, with 45’s, the fellow to my right fired and from that point in time to today I have had tinnitis in both ears. If you don’t have tinnitis and one day find that you have ringing in your ears you will learn in time that you can live with it. Sometimes it’s not even noticeable unless you are in a totally quiet environment. If one can avoid thinking about this malady so much the better. It’s when you focus on that fact that it seems to be at its worst for me. Last Fall the tinnitis in my right ear went to a very loud level and the ringing hasn’t lessened since then. Going to three hearing specialists they have given me the bad news that it won’t get better and my testing scores continue to drop. In March I received a passing grade of 85 for word recognition, and a week ago it had dropped to 23. The good news is that the left ear is still doing a pretty good job. Plus, putting on a headset makes the world perfect once again. If you would like to check the age of your ears here’s a simple test which you can perform on your computer right now. PS…..don’t forget to get signed-up for the Fall Club Pilotos event. It’s filling fast this year. I just could not resist passing on this link which will take you to any area of aviation that you could ever hope to read about. We are talking historical, present, NASA, you name it and it is here in all forms. Quite a website sent to me by Bruce Simballa, a friend in Santa Fe, and afficionado of aviation. If you saw the film ‘Baraka’ he was one of four involved in that three or four year world jaunt creating it with a custom built Imax type camera. Just guessing, but for possibly thirty or more years, a Californian by the name of Anders Tomlinson has had an unusual love affair with Alamos. During his many visits to the village he has probably shot more film, of all types, than anyone in the history of the village. Some years ago he created a web site about Alamos. Most unusual is the fact that he has stuck with the project through the years and has created a visual encyclopedia of Alamos and nearby villages, some of it’s history and loads of fantastic videos and still photos of the historic buildings, cobblestone streets, everyday street scenes and more. Most Pilots and Aircraft Owners Should have Received the CBP Notice which became Effective on June 17, 2013. There are important changes in the ‘Overflight Exemption Process’, which include altitude requirements, manifest changes and/or passenger information, fewer or additional passenger changes, flight origination point, etc. Important, this applies as a ‘Southern Border Overflight Exemption’ Process. Under Title 19 Code of Federal Regulations (CFR), Section 122.23, certain General Aviation aircraft (generally private and unscheduled charter aircraft) arriving from some areas south of the United States are required to provide advance notices of arrival and land at certain designated airports for US Customs and Border Protection (CBP) processing unless exempted from this requirement through an Overflight Exemption provided for in § 122.25. Foreign place or places from which flight(s) will usually originate. (19 CFR § 122.25(c)(11)). 2) All Overflight Exemptions will now allow operators to overfly designated CBP airports – from all foreign points – to all airports where CBP services are normally available, provided the operator has complied with all other applicable CBP requirements – including APIS – and landing rights and permission to land have been granted by the receiving port of entry. 3) CBP will also no longer enforce the requirement that operators utilizing an Overflight Exemption carry one approved passenger (19 CFR 122.25(c)(7)) provided the operator has complied with all other applicable CBP requirements – including APIS – and landing rights and permission to land have been granted by the receiving port of entry. GA operators wishing to utilize an existing or newly granted Overflight Exemption will be allowed to arrive with no passengers; with passengers already listed within an existing Overflight Exemption; or with passengers not listed within an existing Overflight Exemption. operators of exempted aircraft must maintain altitudes above 12,500 feet mean sea level (unless otherwise instructed by Federal Aviation Administration controllers). Summer Savings…..$100 less & more? Don’t forget to take advantage of our summer savings for ‘Club Piloto’ members. Check on this site both the ‘Rates & Piloto ‘Packages’ for information on the August Club Piloto Special package. You can arrive early or stay late and only pay an additional $175 per couple (with all meals included for two, including 5 course dinners!). The minimum saving per night is at least $100.00 (U.S.) and a great deal more for the August event. That, of course, includes our complimentary hangar parkng for singles and light twins, plus complimentary ground transportation to and from the Hacienda, PLUS, a complimentary local tour for first timers and membership in ‘Club Pilotos’ with a ‘Capitan’ gift. From the U.S. just call toll free 888-777-0164. Nearly all pilots living in the Southwestern U.S. know about Tucson’s Boneyard. In fact, I have met several European pilots who came to the U.S. just to see this impressive mothballed fleet and to visit the Pima Air Museum. There are tours available at times of the ‘Boneyard’ however you should check with Pima Air for times. Many of us like to get aerial views of the world’s largest mothballed fleet of aircraft. Presently there are about 3,000 aircraft at the ‘Boneyard, with the highest number reaching 5,000.
a. Request Tucson Tower (118.3) to fly over the ‘Boneyard’. b. If Davis Montham Air Force Base isn’t busy they will usually give you an assigned altitude and area north of the freeway to fly. After overflying the Boneyard then continue south to Cd. Obregon (156 Radial from Tucson) International (in a 182 it’s about 2 hours), clear customs and come on over to Alamos (105 radial from Cd. Obregon) only 25 minutes away. Don’t miss our best deal of the year, the August 2013 special which is under ‘Packages’. Now just guessing, you are going to be thinking that Jim is suggesting Cd. Obregon because the staff at the DGAC, Commandancia, Fuel Truck, Immigration and Customs are all friendly, OR, that they have a wonderful runway and ramp parking plus crystal clear controller English, or that it’s in nearly a direct line with routes from Arizona to Alamos? Right? Well your guesses are good but they are not the ‘three’ that I have in mind. My four reasons for clearing, at least into the country especially for your Multi-Entry form the first of the year, are ‘Hector’, ‘Carlos’ , ‘Lauro’ and ‘Rogelio’, all who are the ones who process the Multi-Entrys and do the final ‘stamp’ procedure on your flight plan before you continue your journey. Why are they so great? Twice in the past two weeks we have had some unique issues which were handled by the ‘Commandancia’ office at Cd. Obregon. One this week was regarding a new part-time DGAC person at Cd. Obregon who spoke no English and assumed a U.S. pilot had already entered Mexico at another airport. That pilot, on his way to Manzanillo, overnighted at Hacienda de los Santos. That’s when I discovered that he didn’t have a Multi-Entry and for some reason the DGAC person had given him bad information and even worse consequences had he continued his flight south of Sonora. Calling the ‘Commandancia’, and sending the pilot back to CEN the next morning everything was handled and corrected. (By the way this isn’t just a matter of creating a Multi-Entry, but he had to be taken out of the DGAC system as having a Multi for his flight to Alamos (which he didn’t), but also correcting things with Migracion and Aduana. Everyone cheerfully cooperated and sent the pilot and his passengers on to Manzanillo. The second experience was an error, by yours truly, and made me a real believer in the value of having competent, and caring, staff at the AOE where you have your Multi-Entry created each year. The first day of January, not wanting to delay things, I requested my new Multi at CEN on a flight from Alamos to Tucson, via CEN. In order to expedite the process they copied all of my necessary documents, plus took my payment, and said they would have everything ready to pick-up on my return flight to Mexico a few days later. Now that’s service! What could go wrong? Nothing, unless yours truly or the officer in the Commandantes office wasn’t the one in charge on my return flight. It was a different person and I didn’t ever think about not having the Multi-Entry paperwork in my possession until I was ready to leave Guadalajara International two weeks ago. Guess what? I was not leaving without that necessary paperwork and they would not accept my offer to buy and create a new one. I was in the country illegally without any question until I could prove that I, in fact, did pay and receive one in 2013. One call to ‘Hector’ at CEN took care of the problem. He pulled my information from the Cd.Obregon Airport archives, emailed it to the Commandante at Guadlajara and all was fine. Oops, that’s not the entire story. When returning to Cd. Obregon on our next flight to the U.S., Hector said, “By the way, your medical expired a month ago, do you have a new one?”. I pulled the new one out, freshly signed by Dr. David Bryman of Scottsdale (also our guest speaker at the Spring Club Pilotos 2014) and he was pleased to see it. He suggested that he make a copy of it and put it with my Multi-Entry file, just in case I ever am in a bind again anywhere in Mexico. The Cathedral 3:30 from anders tomlinson on Vimeo. Alamos Thanks ‘Club Pilotos’ & ‘Del Amo Flyers’…..
Those of you who attended the ‘Club Piloto Fall Reunion’ in October, as well as the Del Amo Flyers group and event in November, all deserve a huge ‘Gracias’ from Dr. Elizabeth Petit and many other doctors in Alamos. In time there will be many ‘thank-you’s’ from the residents of Alamos as lives are saved with the important EKG equipment being purchased with your donations this past month. Along with a new EKG machine for the village will be some other important analysis equipment to be used by Dr. Elizabeth which can prove to be lifesaving for children. A total of $6,300.00 (US) was raised and we cannot thank you enough for your generosity. As each of you know your donation is US tax deductible since it went to a US charity in California and they in turn will be actually purchasing and providing the medical equipment. 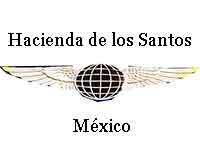 DGAC (FAA-Mexico) Procedural Changes for 2013? Before any of us, (Jim included) push the ‘panic button due to potential changes in Mexico’s entry and exit procedures, we must first take a deep breath, then allow a few weeks to exhale while the DGAC (Mexico’s FAA) has time to evaluate feedback from their own federal departments of Immigration and Customs. Also, they are presently in dialogue with the AOPA and some recommendations have already been made in this area. No doubt the Bush Pilots International and Caribbean Sky Tours are both representing the foreign pilot with ways to streamline the procedures. Again, don’t panic…wait for announcements in December (if in fact changes are going to take place). OKAY, having said the preceeding, below is a article from the AOPA web site which explains the current procedures and also discusses possibilities of the way the new system could be outlined for 2013. What’s the worst that could happen? We could have delays or problems for the first few until it becomes apparent that it’s not a good procedure. What’s the best that could happen? It might work as well as the U.S. eAPIS. Jim would personally not want to go back to the old US system, he loves filing ahead of time with eAPIS, it’s simple and fast. Ideally, if Mexico had that system and you filed from your easy chair in the U.S. or Canada, then arrived at a Mexican AOE and all paperwork was ready, what could be better? In March, 2012, Mexico’s DGAC presented a draft for a new procedure for private aircraft. We provided them with a number of observations regarding potential issues, some of which were addressed and some of which remain. The following is a summary review of the law, the new procedure and our observations. THE PERMITS: Mexico Civil Aviation Law allows a private aircraft to enter Mexico under either a Single-Entry (SE) or Multiple-Entry (ME) permit. A SE permit is good for 180 days or until the aircraft departs Mexico. The ME permit is valid until the end of the calendar year and an aircraft can enter and depart Mexico as many times during the year as desired with a ME permit. Both a SE and ME permit cost M$ 702 PESOS. THE OLD PROCEDURE: When a pilot requests a SE permit they only receive a receipt and a GHC-001 form. When a pilot requests a ME permit, they receive a 2-page letter (the permit), a receipt and a GHC-001 form. The GHC-001 form is the ONLY document that is recognized by the DGAC (civil aviation), Immigration and Customs. To be valid, the form must contain the stamps from these three federal agencies PLUS the receipt for payment of either the SE or ME permit in order to be valid. The 2-page ME letter has no validity with Immigration and Customs. The GHC-001 form captures the date of entry into Mexico of the aircraft and the date of expiration of the permit. The GHC-001 form gave the pilot/owner a legal document that proved that the airplane entered the country legally and showed the date until which the aircraft could legally remain in the country. NEW PROCEDURE: The new procedure differs from the old procedure in two significant areas: First, the procedure relies on the internet using the CASS (Civil Aviation Security System) which is owned and operated by Mexico’s DGAC. Under this system, Immigration and Customs would have to agree and be dependent on the DGAC’s CASS system to be able to verify the legal status of an aircraft. Initially, the procedure did not consider the possibility of internet or power interruption at an airport. We did not (and still don’t) believe that leaving a pilot/owner without some form of documentation to prove their status in the event of a technical failure of the CASS system, or in the presence of authorities not familiar with the new procedure, was a good idea. Second, the new procedure requires a much more elaborate and comprehensive form for requesting entry into Mexico that resembles more of a contract. We reviewed and edited an English version of this form but it is unclear what happened to the English version that we provided. This system is in the process of implementation until December 31, 2012. There are a number of positive areas as well as a couple of points of caution: 1) There is a new DGAC form for requesting both a SE and ME permit. (SE permits did not require a request form in the past, only ME permits required one). The form requires the owner/pilot to make a number of declarations which state what a pilot should already know: a. Aircraft need to comply with U.S. and Mexican aeronautical regulations while in Mexico. b. Pilots must comply with immigration, customs and sanitation authorities and any other authority as required (likely to mean Federal Police and military) c. Cannot take cargo or merchandise on board that is not personal property (no cargo for hire) d. Must comply with Mexican National Security measures e. Must bring on board the Entry Permit Form (this is a new form also) as well as the receipt for payment of the Entry Permit. f. Understands that it is STRICTLY FORBIDDEN to conduct air charter operations with the use of a SE or ME permit. 2) There is a new form for both SE and ME permits. The new form is now 3 pages long. The text on this form essentially reiterates the obligations described above plus: a. It clarifies once again that a “special” Mexican Insurance IS NOT required. It also clarifies that the pilot is expected to keep their insurance in effect while in Mexico and carry the policy on board at all times. b. Cannot stay in the country for more than 6 months. c. Aircraft MUST enter AND exit Mexico through an international airport. d. Cannot use an airport/airstrip not authorized by the DGAC. e. There are no boxes for DGAC, Immigration and Customs stamps, HOWEVER, we urge that you AT LEAST have the DGAC stamp this form. It is important for the pilot to have in their possession some record of when they entered Mexico and that all formalities were complied with. 3) The DGAC at each international airport is REQUIRED to receive the authorization from local Immigration and Customs officials to allow the CASS system to replace the GHC-001 form. Until this is completed, that airport will continue to use a GHC-001 form. Regardless, ensure that you receive the form from item 2 above and during the short term try and have Immigration and Customs stamp it, if possible. and customs stamp either your ARRIVAL REPORT or even better your entry permit form. You can expect that there will be varying levels of conformity across the country with regards to the new procedures. Del Amo Flyers Take the Town….. The Del Amo Flyers now have a special spot in the hearts of the people of a small Mexican village in the Sierra Madre. After several days enjoying the sights and sounds (Special musical performances by a local Cantina group, the very professional 50 person Ballet Folkloric group from the University of Sonora, the ‘La Estudiantina’ an 18th Century attired group of troubadors and Maestro Ramon Alcantar on his Spanish guitar), of the village. Team ‘Club Pilotos of Mexico’ had a great time for three days last week in Palm Springs at the annual AOPA Expo. With Palm Springs being our favorite location in the U.S., both due to the nearly guaranteed sunny days and high attendance, it brought nearly forty new pilots to ‘Club Pilotos’ and Hacienda de los Santos. A big thanks to Ken & Bonnie Foster, Bruce & Elaine Boland, Vince & Susan Bruno and dozens of other ‘Club Piloto’ members who passed the word at the Expo about the resort and club. Approximately 70 ‘Pilotos’ received the free shirts prepared for the event, six won bonus nights at the resort with the ‘Wheel of Fortune’ and many other prizes. Arriving on a Tuesday so we could participate in the ‘Parade of Planes’ the next day, we beat the rush of an anticipated 1,000 aircraft coming to the area during the three day event. Only one small problem happened to N7277P during the parade, a speed bump was nearly too much for the 310 horse engine to handle. Finally, at full power the mains went over the bump. Thanks to David Naylor, coincidentally an active ‘Club Piloto’ member, took a full close-up video of the hung-up T206H in the middle of the street next to the media bleachers at the Convention Center. The Parade, which originated at the Palm Springs International Airport went more than two miles to the Palm Springs Convention Center. A return parade was held on Saturday afternoon. Fortunately we had no ‘hang-ups’ on the return taxi to the airport.